1. Pirate Alphabet : Pirate themed alphabet with pictures for each letter. The vowels are all one color and then the consonants are another. 6. Pirate Desk Plates : 14 pirate themed desk plates to choose from. Each plate has a place to write the student's name, alphabet line, and a number line 1-20. 7. 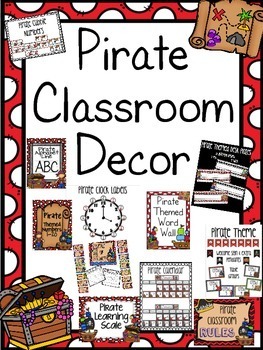 Free Pirate Clock Labels : Post these around your clock to help students tell time. 8. Pirate Marzano Learning Scale : I am so excited to use introduce learning scales to my students. I have heard many great things. The scale rates 0 to 4. There is a one to post on the wall and then a small one to place on student desks. The students can mark on it with a dry erase marker or you velcro for the markers included. There are also blank ones included so you can write your own learning targets. 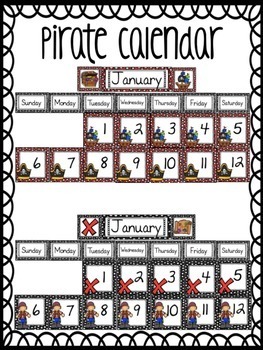 This is a Pirate themed clip chart. Whats included? 10. 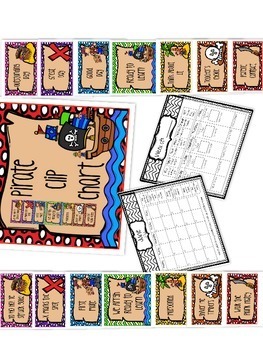 Pirate Numbers : These would be great for any pirate theme classroom. Need cubbie numbers or just numbers for another project? Well look no further. There are 4 different sets each numbering to 30 with 2 blank ones. 11. 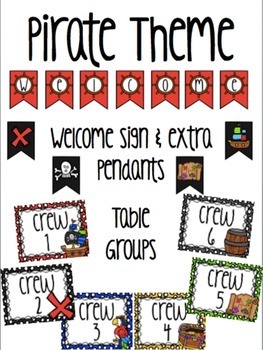 Editable Pirate Rules : Set of 5 classroom rules. There is another set that is completely editable.